In a "coming soon" message seen briefly on VerizonWireless.com [cache], it was revealed that the company will soon carry the Treo 600. While most carriers have had it for quite some time, Verizon Wireless is the nations largest carrier, which means it will probably do quite well. However, with rumors of the Treo 610, we wouldn't be surprised if Verizon Wireless never actually carries the 600. 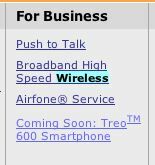 [via Engadget] Update 7/12/04: Looks like the Treo 600 could be coming to Verizon Wireless today.